Over 140 fossils, including a rhino skull believed to be over 8.5 million years old, have been discovered during an excavation in central Turkey's Çankırı. 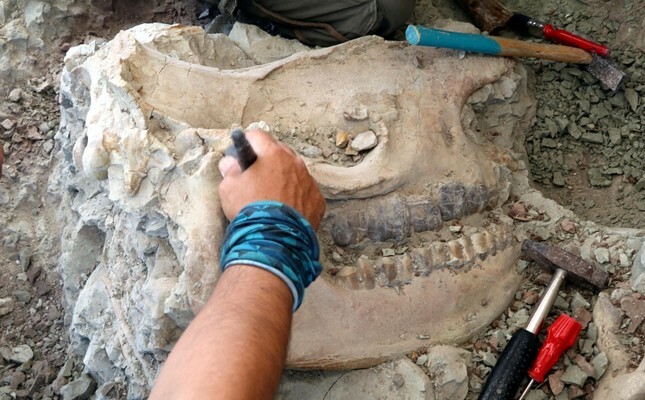 In this year's archaeological dig carried out in the "Barren Places Vertebrate Fossil Locality," excavated in the city's Fatih neighborhood since 1997, fossils belonging to 15 species have been discovered, including giraffes, horses, sheep and also the skull of a rhinoceros which is said to be rare in the Anatolian region due to its size. Professor Ayla Sevim Erol, a faculty member of the Anthropology Department of Ankara University's Faculty of Language and History and the director of the excavation site, told an Anadolu Agency correspondent that the most important finding of this year's dig was a complete skull of a giant rhinoceros - a predecessor of rhinos as we know today. "We can easily say that the rhinoceros skull fossil discovered is over 8.5 million years old," Erol explained. "Until now, we have obtained over three types of rhinoceros in this area. Almost 500 rhinoceros skulls have been removed from the area," Erol said, saying that this points to the presence of a wetland in the area currently classified as a barren site. Despite bad weather conditions this year, Erol said that her team managed to excavate 140 fossils in the area, and they are waiting for their findings to be published in scientific journals. She added that nearly 5,000 fossils have been recovered from the site.